Allow time for images to download! FRITJOF MEYER is standing firm against the extreme leftwing onslaught and the mud flung at him by the conformist historians. As a minor service to completeness, we reproduce below the Index to the controversy posted by the extreme leftwing idgr (Informationsdienst gegen Rechtsextremismus, an extreme leftwing German body). It contains nothing we have not already published. For the record: This translation and the original article are posted on this website without the consent of Meyer, and on our own initiative. FIRST of all, I wish to express my thanks to Franciszek Piper for his thoroughgoing critique of my article. I now take the liberty of responding to his critique, and I request that my reply be published on the same website as his. Piper's review is the first serious critique of my study. If I had doubts about some of my conclusions, his criticisms have put them to rest, since he is the expert in this area. Not a single one of his relevant objections is convincing, therefore I consider my study completely vindicated. He and I are in total agreement that the atrocities committed in Auschwitz are unequalled with regards to their extent, methods employed and above all, the character and philosophical background of the perpetrator: the former nation of poets and philosophers. It goes without saying that the actual number of victims, whatever it may be, cannot detract from the severity of the unique crime of mass murder by poison gas. In the long run, however, credibility alone retains the power to convince. Such credibility is vital for the survival of modern society, in order that succeeding generations may draw vital lessons from it. Grossly exaggerated numbers, on the other hand, support the arguments of none except Holocaust deniers and apologists for National Socialism. My article in "Osteuropa" was also directed against the Revisionists. Where propaganda is concerned, the magazine "Nationalzeitung" praised the new total as the "Truth about Auschwitz" Thus, even the mouthpiece of German rightwing radicals finally acknowledged the defeat of the Auschwitz deniers. Among these deniers, the publisher of a periodical appearing in England dubbed me an "egalitarian re-educator" and "diploma demagogue" who writes "shithouse slogans." I actually felt honored by that! In addition, an Italian Auschwitz-denier recently published a study of the document which I quote (and he questions) concerning the conversion of the two farm houses "for special measures" (specifically mass murder), although he states laconically that ." . . there is no doubt these buildings served as storage facilities." It is very much to the credit of the Auschwitz museum, its archives section (the APMO ), and especially Franciszek Piper that they corrected the misleading number of four million victims to 1.1 million, following the collapse of the USSR. My result, which will certainly not be the ultimate truth concerning the number of Auschwitz victims, varies less from Piper's result (or Pressac's, or Reitlinger's) than does Piper's from that of the Soviets. They had insisted on gross exaggeration for almost a half century, even in the face of irrefutable information which had been privately before Piper at the time. And yet, oddly, Piper still maintains, in the absence of documentation and in the face of very informative eyewitness accounts, that "we should accept 4,000,000 as a figure that . . . reflected the actual human losses in Auschwitz." Such a judgment is adequate vindication for publication of my study which, in the sense of the German word "fragwürdig" is of course "worthy of questions." Not malicious or supercilious questions, but necessary questions. As recently as last year I noticed that in the Auschwitz Museum a guidebook was still being sold, in which former director Kazimierz Smolen [below, lecturing to German pupils recently] insists on the figure of four million. According to Piper, this imaginary number is based on crematorium capacity. This is in part my approach as well. It leads to a tenth of his alleged number of victims. It is based also on detailed eyewitness accounts by Tauber and Dragon, which had been kept secret for several decades. The fact that both of them stand by the number of four million, which they by themselves could not have established, speaks against the reliability of their eyewitness testimony. Such an extremely high number would necessitate a crime locale vastly different from the two converted farm houses. The crematoria would have been suitable for homicidal gassings, at least experimentally. However, in the Soviet commissar's report, mention of both crematoria and gassings is limited to a single sentence. The meager results of the commission's findings cannot be explained as simply dearth of information. Foreign experts such as the International Red Cross were not allowed to investigate Auschwitz, as the National Socialists had invited it to investigate the Katyn Forest massacre. The commission completely ignored Western sources of information such as the WRB report. Furthermore the Red Army possessed all the Central Building Administration documents, camp death rolls, directives of the camp commandant, and possibly the entire camp archives containing more than 127,000 documents. According to the interrogation report the Russian interior ministry returned these to Poland soon after the camp was liberated. According to Piper, however, all this evidentiary material was "destroyed before liberation." The Soviet investigatory commission included, in addition to the charlatan Lyssenko, two members who had investigated the Katyn massacre and blamed it on the Germans. Furthermore the Soviets had already grossly exaggerated the number of dead for Majdanek (they claimed 1.5 million) and Treblinka (3 million). As early as December 1944, Ilya Ehrenburg had counted six million Jewish victims and declared that all Jews who died in custody of the Germans were murdered. Since then, for two generations, this horrendous number of six million has been used as a rhetorical "club" (Martin Walser) with which to beat the German "nation of criminals." However, genocide of such massive proportions could not have remained invisible to the whole German nation. The six million figure was a case of neverending wartime propaganda. Moreover: In the commission's report, which was the first information the world received about the liberated concentration camp of Auschwitz, there is not a single word suggesting that exterminations of Jews occurred there. In the 21 printed pages which it takes up in the Nuremberg Tribunal, there is mention of only one Jewish victim, a "Jewish woman named Bella from Greece." According to the testimony of one witness, she was a victim of medical experimentation. According to the Soviet formulation, Auschwitz was used for the extermination of "citizens of all the countries of Europe." The commission's findings offer no explanation as to why the Germans would transport large numbers of persons across Europe in order to liquidate them. The report includes testimony such as "A Hungarian woman from Cluj" (Klausenburg), named Anna Keppich. It describes the arrival of 3000 Hungarian internees but makes no mention of mass murders of tens of thousands of Hungarian Jews in 1944. In fact, in the testimony of several witnesses, family names are the only indication that the subjects were Jews. The Investigatory Commission contains an "Appeal to the International Public" signed by 27 former inmates. Although these are all Jews, they too are identified only as "inmates of all nationalities." Once again, in the case of the massacre at Babi Yar, which was investigated by the same officers of the court, there is no mention that Jews were the principal victims. This omission was done on orders from higher up, which gives causes suspicion that these millions were victims of Soviet atrocities. The fact that State Prosecutor Rudenko had been involved in the Katyn massacre makes this all the more likely. It could also be that these statistics were falsified or manufactured as another propaganda lie; and this is what brings the subject within my realm of professional interest as an expert on Russia. The author of a factual and realistic depiction of atrocity is not responsible for irritations caused by his revelation. Rather, it is the instigator of tenfold exaggeration of numbers of victims who is culpable, along with everyone who supports the atrocity by allowing himself to be used as an instrument of propaganda. Back to the subject! I shall abstain from footnotes here, since the sources are familiar to everyone. In the brief span of my article I eschewed any debate with Hilberg because he introduces no new sources. The same goes for G M Gilbert, since he lists no sources. I carefully considered Langbeins publications even though he maintains that Gas sei aus den Brauseköpfen, just as Höss allowed himself to be convinced by the psychologist Gilbert. This is always a sure indication that the person concerned was no eyewitness. Likewise, I did not include Wellers' study. For Poland he gives the grossly exaggerated number of 600,000 Jews deported to Auschwitz; even Piper censures this. He goes so far as to include unborn children in his total. In the authoritative study by Kogon, Langbein, Rückerl and others, National-sozialistische Massentötungen durch Giftgas (National Socialist Mass Murders by Poison Gas), Frankfurt/Main, 1983, pages 194 et seq., Wellers calls the statements of Auschwitz Commandant Rudolf Höss "the most important evidence." However, he omits the reservations, which are shared by Piper. Wetzler, Kula, Broad, Feinsilber, the Dragon brothers and Silberberg (none of whom were actual witnesses to Crematories I and I); Dejaco and Baer, who testified only about the ground following the gassing; Lettich as well as the buried texts (limited to the "farm houses," the Bauernhäuser); Mandelbaum, who worked in Crematory II for three weeks but made no specific statements concerning it; and Niyszly, who later corrected his statement especially regarding the greatly exaggerated numbers. The most important witness was Henryk Tauber, who worked in Crematory I (during the experimental phase only). Another important witness was inmate the prisoner and doctor Bendel, who admittedly in the Hamburg trial [of Tesch and Weinbacher] parrotted the total of four million dead, a number which he had adopted from the statement of the Soviet prosecutor at a Nuremberg trial two weeks earlier. This four million figure represented a tenfold amplification of the total number of victims. Pressac doubts that Bendel had ever been an eyewitness. Since he had been Mengele's assistant he was afraid he would be suspected of collaboration, as was Niyszli. He had good reason to be concerned. Bendel incidentally went so far as to claim that the homicidal gas chambers were identical with the chambers used for clothing disinfestation. In the Frankfurt Auschwitz trials, the witnesses Filip Müller, Paisikovic and Porebski testified only with reservations. In "Gas Chambers and Crematoria," his 1998 contribution to Gutman's and Berenbaum's Anatomy of the Auschwitz Death Camp (pages 183 et seq)., Piper presented no new evidence. The same goes for Dlugoborski's and Piper's, Auschwitz 1940--1945, vol. iii pages. 170 et seq. On the subject of Auschwitz, Golczewski contributed only two paragraphs and five other sentences (Benz, Dimension, page 469). As for the inmates left behind in 1945, he testified: "It was no longer possible to kill these witnesses." And yet, Elie Wiesel (left) and his father were given the option of remaining behind or joining the evacuation march. Piper includes the first edition of Danuta Czech's Kalendarium published in 1958, the year of my first visit to the Auschwitz Museum. At that time the museum was still being misused in a decidedly chauvinistic manner. Piper includes it among the historiographical investigations even though it was clearly an instrument of Soviet propaganda. In her Kalendarium Czech erroneously alleged, without any evidence, that a large number of transports were gassed. Many members of these transports were not killed, however. Perhaps the best know member of these transports is Simone Veil, whose transport arrived in Auschwitz on 13th March 1944. She subsequently served as President of the European Council. In the third edition of her Kalendarium der wichtigsten Ereignisse (Dates of the Most Important Events) published by Dlugoborski/Piper in 1999, Band V pages 184-, this entire transport is missing, as well as the very large transports from France in August and September 1942. For this reason I relied entirely on the corrected Second Edition of 1989. The "showers and steambeds," [sic. steam baths?] which were still presented as evidence by the Polish government in Nuremberg, were never used to commit murder, even at the euthanasia sites. Höss's text "Die Endlösung" (The Final Solution) seemed suspicious to me because it is primarily a compilation of his forced confessions of March 14, 1946, subsequently expanded. Toward the end it is written in someone else's hand. For example, in the sentence "Both Crematoria I and II had the capacity to cremate around 2000 bodies in a 24 hour period," someone has inserted the word "each." " . . . these numbers were never achieved; not even the individual transports were this large . . . The numbers given by former inmates are utterly fantastic, with no basis in fact whatsoever." Before the Polish court in 1947, Höss revealed that the average period of crematory operation was eight to ten hours. It was this information, unavailable until 2002, that inspired my article. It is noteworthy that in his memoirs, the last thing he wrote before the gallows, he failed to identify the crematory cellars [sic. Leichenkeller, basement mortuaries?] as a place where murders were committed. He does, however, describe in detail the murders committed in the converted farmhouses [Bauernhäuser]. He mentions "hundreds of thousands" of murdered women and children. Here again it appears that someone was directing him: "At the behest of Himmler, Head of the Reich SS, the concentration camps were converted to armaments production" he writes. The next paragraph begins with the exact same words: "At the behest of Himmler, Head of the Reich SS . . . " and then continues " . . . Auschwitz became the greatest institution for mass murder of all time." Remarks on 1): The capacity of the crematory ovens. Here Piper is relying on a "crucial document" which is in fact a forgery: the "letter" written June 28, 1943, allegedly signed by a certain SS Sturmbahnführer (Major) named Jährling. The document is not signed, even by civilian employee Jährling, the real Jährling of the Bauleitung (directorate of the building administration) who was by no means an SS Major. Piper should have been aware of this since he himself quotes the source document "SS in Einsatz" (SS in Action). Mr. Jährling's name appears on the list of people receiving copies (page 269) but nowhere else. We note that this is the "doctored" version of 1957 which originated in the DDR -- somewhat mysteriously, according to Piper, from "Domburg, BRD." The only Domburgs are in the Netherlands and Surinam. Furthermore a semi-original of this is to be found on page 24 of Piper's book, Die Zahl der Opfer von Auschwitz (The Number of Victims of Auschwitz). It is a corresponding, manipulated facsimile of an authenticated carbon copy from the files of the APMO. The original is to be found in the Moscow Special Archives (502/1-314). It was known to exist in the DDR In the DDR as early as 1957 -- by no means "destroyed before occupation." Van Pelt published the original as a facsimile in The Case for Auschwitz, page 343: ." . . In the list of recipients, Jährlich's name is written in by hand only. His name was subsequently transferred to the counterfeit version by typewriter, in place of a signature. In this way the impression was created that the letter had been sent." The original is not signed because it was a rough draft which obviously was never mailed. This is clear because it refers to the "Bau-Erläuterungsbericht" (Explanatory Construction Report) dated October 30, 1941, which had been superceded. It contradicts initial operational test results, as is proven by my "crucial document," namely the letter from Engineer Kurt Prüfer dated September 8, 1942. Note: Here I did make a mistake similar to that of Piper: When ordering the article, I misread a handwritten notice "Buchenwald" as "Birkenau." The mistake is entirely inconsequential, although Piper claims that ." . . this mistake by Meyer makes unnecessary any further commentary on or evaluation of his findings." at Buchenwald. It had been in operation for two weeks, since August 23, 1942. The second oven went into operation on October 3, 1942. The "results as reflected in practical operation" shows up again in a second letter of Prüfer's dated November 15, 1942, which is now in the Weimar State Archives, 2/555a (Prüfer Dossier), as was reported by Pressac/Van Pelt. Gutman/Berenbaum tells us on page 212: ." . . Prüfer's letter states 800 bodies per day for each larger crematorium." In the unmailed draft of a letter dated 28th June 1943, the number was erroneously stated as ." . . 1440 bodies per day." Witness testimony stating numbers larger than this should be disregarded. Pipers statement to the effect that Henryk Tauber testified that Crematory I processed 2500 bodies in a single day is not factual. Tauber did not state that; in fact he said just the opposite. In Dlugoborski/Piper, page 291, he states that the cremation of 1492 bodies from the Krakau transport of 14th March 1943 in 48 hours was not possible. Footnote 18: belongs to the preceding sentence. Footnote 19: "Ernst" Stäglich should be "Wilhelm"
Footnote 34: The second word, "Menschen" (people) should read "crematories." Footnote 39: should read IMT Band VII, page 647. Footnote 45: inside parenthesis should be "Footnote 19" and what is called "Footnote 5" should also be "Footnote 19." Remarks on 2): Average Hours of Operation Nine Hours per Day. This average figure given by Höss is not questioned by Piper, who had the advantage of being familiar with the court record. Likewise it is not contradicted in Piper's subsequent quotations of Höss regarding full capacity with allowance for the defective ovens. I declined to comment on Jährling's figure for daily coke consumption of 7840 kilogramms, although, given 1440 cremations with the unrealistic consumption of 5.5 kg per body, this would confirm my figures. If we use Prüfer's figures of daily crematory operation time of 12 hours, the capacity thus achieved is not changed by occasional 24 hour operations; however, this never achieved anyway, since the eight to ten hour figure given by Höss is the average for the entire period. The progress reports of the Sonderkommandos (special duty details) however, do not refer to an average for the entire time the crematories were in operation, as does the number given by Höss. Rather, it refers to the period of the actions in Hungary, when the crematories (with the exception of Crematory III) were all functioning and an unusual number of persons were indisputably being gassed. The murder of 40,000-42,000 Hungarian deportees in accordance with Kaltenbrunner's message to Yorck von Wartenburg, was not restricted to the month of October, in which a corresponding number of persons were murdered in accordance with Kaltenbrunner's authorization. During that terrible month, in which the revolt of the Sonderkommandos (special detail) took place, around 15,000 registered camp inmates were gassed. This suggests that a corresponding number of Hungarian victims had already been killed. Even if the capacity of the crematories had been greater, the additional capacity would not have been needed, in view of the numbers of persons transported. For this reason new uses for the building were found, including housing for special detail prisoners, air raid shelter, and bathing and sanitary facility. Here I must remark that it is very unjust to designate Stauffenberg (York von Wartenburg in my article) as a lying "Nazi dignitary"
Piper is referring to Höss's statement to the effect that Crematory III was frequently inoperative. I, on the other hand, quoted Höss literally, from The Final Solution, "Commandant in Auschwitz," page 165): "Crematory III soon broke down completely and in future was never again used." The members of the Sonderkommando were soon housed in this crematory. The number of 87 stokers for Crematoria III and IV refers to more than the size of the operating crew of Crematory IV. It also included auxiliary or standby stokers living in Crematory III. Remarks on 4): Time Required to Cremate Three Bodies. According to Wetzler, who based his figures on Müller, the time required for cremation of a body was 90 minutes. For this reason I found it difficult to understand the observations of prisoners who reported that it required 30 minutes or less. This was simply impossible, as was the reported "Nachladen" (afterloading) of muffles after a half hour. This would have allowed a maximum cremation of three bodies in an hour and a half. However, the result is unchanged, unless one assumes, as Piper was fond of assuming, that nine bodies were cremated every hour and a half. In today's most modern crematoria, the process requires at least 45 minutes. "Ober-Capo August explained to us that according to the plans and calculations for this crematory, 5 to 7 minutes was allowed to burn one corpse in a muffle." Even Piper believes statements to the effect that five bodies could be cremated in 20 minutes. In reality, however, it was quite impossible to cremate 1492 bodies in 48 hours in those 15 muffles. Piper accuses me of speculation as to the operating times of the crematories (I wrote 971 days for Crematories I and II, 359 days for III and IV). In footnote 19 of my article I gave the sources of my information, namely the following APMO documents: File memorandum dated March 17, 1943 concerning damage to Crematory I, on page 54 of document BW 20/7/34; letter to Central Building Administration addressed to Topf dated July 17,1943 concerning repairs before they were completed, page 17 of BW 30/34; Cracks in the oven of Crematory III, page 42 of BW 30/34; Telegram sent to Topf on May 14, 1943, page 41 et eq. of BW 30/34, concerning damaged chimney of Crematories I and III; telegram concerning twenty oven doors of Crematories I and II in need of repair between October 21, 1943 and January 27, 1944 as well as beetween April 3 and October 17, 1944, Dpr.- Hd/11a, pages 95; and seven oven doors in need of repair between June 20 and July 20, 1944, Czech page 789. According to my perhaps inexact count and partial approximation, Czech calculates 346,000 inmates registered after arrival (including 29,000 from the Hungary transports. In addition, another 59,000 deportees must have been registered later, making a maximum of 405,000 altogether. In addition to these there were 10,000 registered and segregated prisoners of war. Also 315,000 persons deported to Auschwitz (after deducting those subsequently registered) who never received a registration number, in addition to at least 3,000 prisoners of war and (after deducting the registered) 151,000 deportees from Hungary for a total of 884,000 delivered to Auschwitz. What was their fate? 126,000 registered inmates (non inclusive of those gassed) died. According to the death rolls 12,000 died in 1940/41 (Pressac, page 195); and 82,609 died in 1942/43. Victims of gassing not designated. Another 315,000 died in 1944/45 as estimated by APMO. 225,000 prisoners and 110,000 Hungarians were transferred to other camps, 58,000 evacuated, and 8,500 were officially left behind. According to this, these 401,500 survived Auschwitz. Inclusive of the 126,000 who died, for a subtotal of 527,500, this produces in view of the 884,000 who were transported, a difference of 356,000. In my opinion these were gassed. Piper believes that in view of the 225,000 transferred to other camps, I arrived at the figure 110,000 deportees from Hungary by the doubled addition of 58,000 evacuees. This is not the case however. Piper does not mention the source which I gave for the 225,000. This is the article by Gutman/Berenbaum, page 76 footnote 75, in which he refers to a corresponding list of colleague from the APMO, Stanislawa Iwacko. Whether the number of transferred includes the 58,000 evacuees of January 1945 will be known when the APMO releases Iwacko's statistics, which are contained in Volume 100 of the Ausarbeitungen (Working Files). So far they have refused to do this both verbally and in writing. Of the 405,000 registered 126,000 died, according to the death rolls. According to closer analysis of Czech's entries, approximately 128,000 were sent to other camps and 58,000 evacuated. Thus 186,000 of those registered fall into Iwacko's number, leaving 39,000 unregistered transferees. 8500 registered inmates were left behind, making 320,500 altogether. Around two thousand were released or escaped. In that case, 82,500 registered inmates were gassed. This calculation would agree with Lang's assessment (see Footnotes 32 and 63 of my article) that 261,000 registered inmates perished, if he had included 41,000 unregistered prisoners from Hungary who were murdered. This leaves unanswered the question: what happened to the rest of the unregistered prisoners? Of the 318,000 unregistered prisoners 39,000 were handed over to other jurisdictions and 279,000 subsequently died in gas chambers. Of the 180,000 deportees from Hungary 110,000 were likewise handed over to other jurisdictions, 29,000 subsequently registered, and 41,000 gassed. All together, 279,000 unregistered prisoners subsequently suffered this terrible fate in addition to 41,000 Hungarians, plus the registered inmates, who according to the present hypothesis numbered 82,500; therefore 402,500 all together. In my calculations there are indeed several uncertainties, however. In the final situational report, dated 17th January 1945, the reports of twelve of the 28 subsidiary camps are missing. Furthermore it is possible that the numbers of abandoned and freed prisoners were significantly higher. The chief medical officer of the 100th Soviet Infantry Division, S. Amaglobi, reported on 20th January 1945, not only that the SS removed 60,000 prisoners from Auschwitz in their retreat, but also that they left 15,000 to 20,000 prisoners behind -- more than just 8,500, more than just the seriously ill. The chief political commissar of the 60th Army reported 17,000 liberated prisoners; he saw "endless human masses" of released prisoners. The previously calculated number of gas victims could be smaller by this amount; correspondingly, my estimation of 356,000 gas victims would be even more accurate. The total of dead as reflected in the death rolls plus this total of gas victims is 482,500. This is fewer than the half million victims I had assumed as a minimum number. In addition to these we must include an unknown number of victims buried in mass graves, plus others cremated outside the camp: those who were originally in the euthanasia institutions Pirna / or cremated in the ovens of the secondary camps Trzebinia, Blechammer and Charlottengrube. At least 100,000 Poles were shot, including those condemned by the drumhead court martial at Kattowitz. In addition, we must include 1700 Gypsies were never registered. Finally, around 1500 prisoners were simply released, and at least 500 were able to escape. The appraisal of death rolls for 1944 which the APMO undertook, according to Pressac, appears to me to be too low. Between 482,500 and 510,000 people lost their lives in Auschwitz. That is a terrifying number, difficult to comprehend. It makes Auschwitz unique among extermination camps. The number of victims represents the combined residents of five major cities. It is greater than the number who died in Hiroshima and Workuta combined, ten times as many as died under the bombs in Berlin. It is equivalent to a massacre such the World Trade Center repeated every week for three years. Of these, according to my calculations, the 12,000 victims of the years 1940/41 (see Pressac page 195) were incinerated in the crematory of the main camp and subsequently another 314,000 in the four crematories at Birkenau. According to Höss, another 107,000 were burned under open skies in 1942, as were at least 40,000 in 1944, in my opinion. Between 9,000 and 37,000 must have been burned in the old main camp crematory between 1942 and July 1943. If we assume one body per muffle per burn, the hypothetical capacity of the old crematory would be 24,000 cremations. In Piper's opinion, however, this incineration of 107,000 victims was "pure manipulation" by Höss; my conjectured extension of it into the winter of 1942/43, was "a hypothesis not based on any facts." The question of what happened to over 100,000 unregistered detainees transported to Auschwitz in the winter of 1942/43 is indeed an open question, as I explained in my article. Piper takes me to task over this. Reassignment to other sites in the area was not possible on account of the camp quarantine, and we have no witness testimony on the subject. Their fate remains an unsolved riddle. I assume that most of them were gassed in the farm houses and burned on pyres. Mass graves were no longer being allowed, and the new crematories were not yet operational. According to Höss the old and barely functional crematory oven broke down completely in July 1942, for an unknown period. Even assuming three cadavers per muffle, or 150 cremations per day, it would have been able to cremate no more persons than are listed in the death rolls. What happened to the bodies if they were not burned in the open, as Piper suggests? Piper's critique concerns primarily the number of those who were delivered to be killed, that is, the unregistered. Let us first deal with the unregistered transportees from Hungary to Auschwitz. It is not true that I rely on any set ratio between transports arriving daily and the number of registered inmates, as Piper suggests. I rely exclusively on the transport arrivals noted by Czech. I am willing to publish my separate research on deportees from Hungary, if Piper wishes; the Website would be quite suitable for this. In my research I rely particularly on number data from the deportation zones themselves. The numbers given by the German diplomat Edmund Veesenmayer are approximately double the others. This is because they were originally supplied by the Hungarian police, who had reason to amplify them. 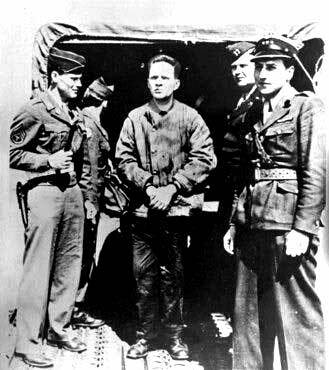 I take Gerlach/Aly as my source for the reassignment of 110,000 Jews from Hungary into other concentration camps. Piper ignores this reassignment completely, while accusing me of manipulation. He quotes no figures except Strzelecki's numbers, and even then not exactly. In his lists for the period May to October 1944 (pages 349 et seq)., Strzelecki gives the figure of exactly 104,550 prisoners who were registered and then transferred to other concentration camps. Strzelecki however counts unregistered prisoners as well. He tells us that additional ." . . tens of thousands, up to 100,000 Jewish prisoners passed through Camp Birkenau without registration" during this period (note on page 352). Piper assumes that "passing through the camp" excludes the possibility that they might have literally passed through and been reassigned. For him, it necessarily implies gassing. Interpreting it this way would mean that a maximum of 100,000 unregistered prisoners were gassed from May to October 1944, during the Hungarian operations. However, that would correspond more nearly to my numbers than to the number of 400,000 murdered Hungarians. Birkenau was in fact a transit camp for many prisoners who were there a short time only, such as Imre Kertecz, subsequent winner of the Nobel prize. He spent three or four days there. Furthermore we are concerned here with Polish deportees. Piper, following the example of Gilbert (who chooses to ignore his sources) estimates their numbers as being far higher than does Danuta Czech in the Kalendarium. Piper's numbers are higher also than the High Commission for the Determination of Hitlerian Crimes in Poland (See Obozy hitlerowskie ziemiach polskich 1939-1945, Warsaw 1979). Since this is the area of Piper's specialty, we will discuss it in more detail. Czech arrives at a figure of 132,000 fewer Jews deported from Poland than does Piper, and this basically explains the difference. Czech mentions no transports from Bielsko Biala, Olkucz, Krzepie, Chrzanow, Przemysl and various other places outside the prewar Polish borders. In this Czech is supported by the Investigation Commission, or Obozy (included under abbreviations). In his book Die Zahl (The Number), Piper assumes that altogether around 35,000 were deported to Auschwitz. On pages 183 et seq., Piper counts 70,520 Deportees from Upper Silesia and 61,111 from Bedzin. According to Obozy (page 95, 1941), these numbers should be 5,592 ghetto inmates and Sosnowiec. According to Obozy (page 464), there were 12,000 in the ghetto which was constructed in October 1942. Czech, likewise, counts only 18,200 and is supported by the High Commission. In detail: For May/June 1942 Piper combines the data of Gilbert (5,200) and Szternfinkel (1500: Czech accepted this). For August 1943 Piper counts 34,500 deported from Sosnowiec and Bedzin; Obozy however only 17,000. In the year 1999 Czech suddenly sets the figure at only 2,000 in Dlugoborski/Piper. The police of Upper Silesia had reported 30,000 deportees for both combined but did not indicate their destination. Czech counts only 4,818 deportees originating in Lodz for the period August 15 to September 2, 1944, while Piper (supported by Obozy) estimates 55000 to 65000. As of now, however, transport of such a large number is documented by nothing except a declaration of intent on the part of the German authorities. At the time of the dissolution of the ghetto on 21 August 1944, 61,174 Jews were still there (Biuletyn Zydowskiego Instytutu Historycznego, Warszawa 1955 No.13/14, page 177, footnote 16). 26,000 of these reached Stutthof; they could have come via Auschwitz transit camp. The War Refugee Board of President of the US, which was very well informed, announced in its weekly report for January 1-6, 1945 that 60,000 to 80,000 Jews were concentrated in Lodz. 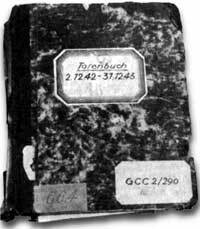 On January 19 these were liberated by the Red Army (Franklin D. Roosevelt Library, Morgenthau Diary, roll 234, 811: pages 229et seq).. At the end of 1945 38,000 Jews classified as returnees were living in Lodz (Encyclopedia of the Holocaust, page 899). June 1942 from Chrzanow (Piper: 4000; Faschismus-Ghetto-Massenmord (Fascist Mass Murder in Ghettos), page 104. According to reports from the resistance in February 1943 deportation was in the planning stage only; additional information is still missing). Aug 4, 1944 from Ostrowiec (1443). Here Piper is relying on Czech's Kalendarium of 1989 and Gilberts Atlas, which lists no sources. In 1999, however, Czech includes only two of these transports (Szebnie and Pustkow) among the "important events" (meaning they are still worth considering). Jul 31, 1944, Pionki (3000, as in Czech). 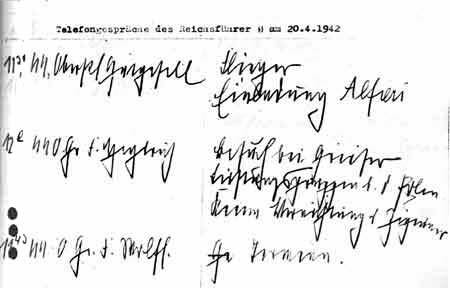 Concerning the size of the transport of December 6, 1942 from Mlawa, Lajb Langfus insisted the following is true insofar as it is legible: ." . . the men for work . . . across from them, children quickly line up in a long row. . . old people as well as young, healthy looking men. . . They strove to maintain the illusion that those able to work, really work. The two selected groups of men stood quietly and observed how huge, brightly painted motorbuses sped back and forth. Very intently, the men watched the women and children standing in rows. Then they moved, and the men saw how nimbly they climbed into the buses. "After the women and children, all those unfit for work were also driven away. . . Afterwards we were sure that in the first group four hundred and fifty were counted, and in the second group five hundred and twenty-five. . . The SS men led us away on foot. . . into Camp Birkenau." Piper believes that those estimated 2500 persons were divided into three groups: Women and children in one, which along with one of the "two selected groups of men" was liquidated. The third group consisted of men who subsequently entered the camp. I read these passages this way, however: "the two selected groups of men" consisted of 450 old and young men who entered the camp. There, according to Czech (second edition 1989, but no longer mentioned 1999), 406 of them were registered under numbers 80,262 to 80,667, while the remaining 44, i.e. the second selected group of men, remained unregistered. At the conclusion of the Langfus text two other groupings are mentioned. One consisted of 450 men. The other consisted of 525 women, children and persons unable to work. These were driven away on busses. Altogether 975 people, the entire transport. "In Birkenau this bath consisted of two areas separated by a hermetically sealed door." Since that time, purchase orders for twenty-two "gastight" doors for the delousing barracks have been found in the Moscow archives, including two doors for the aforementioned saunas. Homicidal gassings with Zyclon B were not envisioned when construction on the crematoria began. 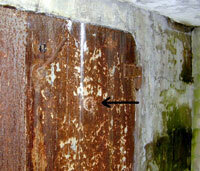 Otherwise it would not have been necessary to retrofit by knocking holes in the roof of the mortuary cellar for insertion of poison pellets when experimentation began. Piper is mistaken in his opinion that the air evacuation system of Morgue B ("B" for "Belüftet") was twice as effective as the one designed for the disrobing cellar, which was twice as large. According to calculations supplied by the Topf family (builders of the crematoria) dated 22 Feb 1943 (Muscow archives 502-1-327), the disrobing cellar had a single three-phase motor of 5.5 HP for ventilation. The morgue, or "B," by contrast, had two motors of 3.5 hp each, for both introducing and evacuating air. According to this the (technically counterproductive) air evacuation system of Cellar B, which was converted to homicidal gas chamber, was less powerful than the system of the disrobing station, which was twice as large. Above: An advertisement from the wartime German civil defense manual, for standard air raid shelter doors and shutters -- the doors have a peephole and protective grill. 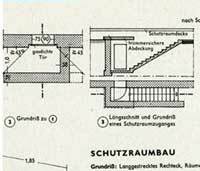 Right (click image to enlarge) -- and instructions (below): From page 256 of Neufert, the standard Third Reich architectural manual demonstrably used at Auschwitz and elsewhere: diagrams of air raid shelters always included outward opening gastight doors with peepholes. In my article I said everything that needs to be said about Czech's reference, ." . . The rest were gassed." Although based purely on assumption, that entry is still found in the second edition of the 1989 Kalendarium. Piper counters with reports of "countless eye-witnesses" who observed "thousands of prisoners in Birkenau" following the path of gas chamber victims. However, that path also led to gas chambers in the farmhouses, which no longer exist. It led past the reception building and central Sauna, which was mistakenly identified by three witnesses as a homicidal gas chamber. Only in a few cases were prisoners observed entering the crematoria. The mere introduction of the poisonous substance by itself could have been part of the procedure for decontaminating clothing and/or corpses of persons who had died of typhus. Merely entering the disrobing cellars, which according to Höß were used as bathing facility following homicidal gassings, could suggest hygienic purpose. This clearly occurred initially in the farm houses, which were originally designated "Troop Saunas." It also occurred in the morgues of Crematories I and II, in a second experimental stage. Real showers and disinfestation ovens were in fact installed in the crematoria. A single eyewitness report, along with an affidavit from Hoess, suggest that occasionally transports of prisoners that had not yet undergone delousing, were processed by camp prisoners who had already undergone disinfestation. Thus the cellars served as a kind of isolation waiting room. Furthermore, finding corpses in the morgue is not particularly significant. The first day he worked there, Henryk Tauber reported seeing 45 corpses in Crematory I which originated with Farmhouse/Bunker II. Thus, following the above criteria, we have a half dozen witnesses attesting to continuous use of the mortuaries as homicidal gas chambers for the entire sequence. This contrasts with witnesses recalling it either vaguely or in a self-contradicting manner 50 years later (Tauber for the experimentation phase and the imprecise observers Höss, Bendel, Niyszly, Mueller, and possibly Paisikovic). For homicidal gassings in the farmhouses, on the other hand, we have forty-one eyewitnesses. This group also requires detailed and comprehensive investigation, which I will provide if publication is desired. It is welcome news that Piper now confirms what heretofore was hardly mentioned in Auschwitz literature. According to Piper, the four crematoria were built in order to gas 1.6 million persons every year. And yet the number of unregistered persons deported to Auschwitz decreased dramatically just as these crematoria were going into operation. Furthermore the decrease occurred on Himmler's orders and continued for almost a year. After this came primarily the Jews from Hungary, who were brought to Germany on Hitler's orders for the express purpose of producing his "wonder weapons." To these transports of forced laborers the Hungarian police added family members who were unfit for work, hence promptly gassed. The decrease in gassings at the beginning of increased crematorium capacity is not explainable by Piper's assertion that "the majority of Jewish communities been had already liquidated." Around 700,000 Polish Jews were still alive, as well as the overwhelming majority of Jews in France, Romania, Bulgaria, Italy, Denmark, Hungary -- over a million. Piper's explanation that subsequently registered prisoners continued to perish from hunger, pestilence, phenol injections, shootings "and continuing selections for the gas chamber" does not begin to suffice. Piper reproaches me with the assertion that I would claim all these as gassing victims. I fear he does not understand the problem. I was merely pointing out that, during the eleven months following Himmler's order and altered crematory operation, the number of unregistered arrivals (potential victims for routine gassing) sank to 242 per day. 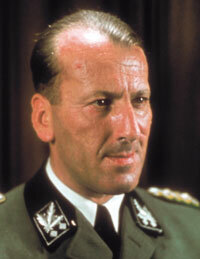 Himmler's stop order, which Piper dismisses a directive issued bys Glücks, has so far hardly been examined. The revisionists dismiss it because it provides evidence that homicidal gassings had been routinely carried out before the order was given. Historiography ignores it because it includes the Auschwitz atrocities under the heading of euthanasia, as developed from the testimony of Camp Commandant Aumeier. Piper rejects it as well, since it flies in the face of every generally acknowledged fact on the motives for mass murder. "Handicapped persons, the insane, cripples, and diseased persons are to be eliminated from the camp by liquidation in order to relieve pressure on space. This measure has however run into a problem, inasmuch as the RSHA had issued an instruction to the effect that Poles, unlike the measures employed vis a vis the Jews, must be allowed to die a natural death." This camouflaged mass murder of "useless eaters," arising primarily from cost-efficiency considerations, was tantamount to a unique crime against humanity. The background to this unique crime is also the direct [Euthanasia] order of Hitler , which is lacking in other cases, backdated to the day the war began, and initially set into motion with the gassing of 70,000 Germans. In April of 1943, when the Birkenau crematoria began operation and Himmler promptly shut them down, an inteerpreter [Paul Schmidt] recorded Hitler's only admission of genocide in Poland, uttered to Reichsverweser Horthy [Hungarian head of state] -- though still in the sense of his comprehensive euthanasia decree of 1939: "If the Jews there did not want to work they would be shot and if they were unable to work they would starve." Specific economic considerations led also to forced labor, which was not based merely on "extermination by work." Both these forced labor enterprises and Himmler had a strong interest in preserving the productivity of their slaves. Piper himself reported on SS locations ." . . in which they occasionally were concerned about a rapid diminution of the labor force, and then intervened in favor of the prisoners" (Dlugoborski/Piper, Volume II page 153). He also remarks that "economic considerations" kept the Nazis from liquidating the Lodz Ghettos. Piper is clearly puzzled by Himmler's stop order, regarding it simply as "a literal interpretation of the ruling." Issued shortly after Stalingrad, this order coincides with Germany's realization that it was facing a severe shortage of basic manpower. This is what drove Hitler to include 200,000 Hungarian Jews in the forced labor pool. Furthermore they were introduced into Germany, which he had long desired to have "free of Jews." This is the reason why Himmler restricted gassings to mentally ill prisoners; he even ordered light duty for bedridden prisoners at Auschwitz.
." . . in addition we have recently had to deal with the solution to the Jewish problem. This has caused the number of prisoners which we must accommodate to rise quickly from 60,000 to 100,000. Most of these are intended for the large scale industries developing in our area. Our camp includes in its assigned area several defense plants for which we must provide labor." In accordance with Operation 14f13 (and not just in Auschwitz), those who were unfit for work comprised the major portion of prisoners destined for liquidation before Spring 1943 and following early Summer 1944. Concerning Majdanek, Golczewski writes that ." . . they no longer want to be responsible for feeding nonproductive Jews. . . there are constant conflicts between "euthanasia" and "final solution." Gerlach notices this even in the mass executions carried out by the Einsatzgruppen ("special mission" units). Among the reasons which he gives for liquidating the Jews in the General Government of Poland is "Ernährungspolitik" (food policy). He refers to an order of Hitler's concerning the necessity to ." . . redress the food balance in Europe." Website illustration, above: A minor puzzle. 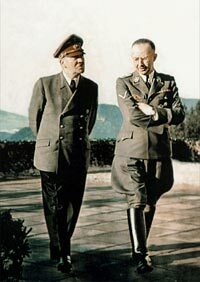 On April 20, 1942 Himmler visited Hitler for birthday celebrations. That day he noted a phone conversation with SS Obergruppenführer Heydrich, with instructions that there was to be no liquidation of gypsies. Conformist historians like to ignore such genuine documents. The sequence for extermination of "useless" groups was determined by the ideological and imperialistic motives of the ruling clique of mass murderers. First came handicapped German children, then handicapped German adults. Next in line were the Polish intelligentsia, Russian prisoners of war, Jews capable of combat in Russia, all Jews in Russia, and then handicapped Russians. The Russians were followed by the millions of Jews in Poland and Western Europe, especially those unfit for work (the reason for the selections). The gypsy "Mischlinge" (mongrels) who were unfit for work came next. After these came severely wounded German soldiers and civilians who had been disabled by bombardment. These were then followed some 35,000 Polish tuberculosis patients, who were to be liquidated on the recommendation of their Gauleiter. Then came 30 million Slavs, on Himmlers recommendation. Finally, as proof of Hitler's version of absolute Social Darwinism, it would be the turn of the entire German nation: ." . . Then it must perish and be annihilated by another, stronger power." Today more than ever, productivity determines the individual's worth in society. We can draw more relevant admonitions from the economic roots of the totalitarian resort to mass murder than we can from our attempts to imagine a phantasmagoria of terror which will always remain unprovable.
." . . changes its treatment of the sick patients in the blocks of prisoner hospital in Auschwitz concentration camp. The murder of seriously ill prisoners by phenol injections and/or gassing is halted. In the following month the numbers registered daily in the base camp mortuary book sinks to fewer than 30, on some days fewer than 20. The function of the inmate hospital gradually changes from that of 'antechamber of death' to that of a real medical facility with the mission of saving human life. After August 1943, selections of Jewish prisoners begin again. In Prisoners Of Fear (London, 1948, pages 69 et seq). Ella Lingens confirms that until August 1943 no homicidal gassings had taken place which could have been observed by the prisoners. Later, however, she was able to observe only the pathway leading to the crematoria and no further (pages 161et seq). According to inmate writer Tadeusz Paczula in Death Books of Auschwitz (Munich/New Providence/London/Paris 1965, page 54): In the inmate hospital of the base camp at the beginning of 1944, the death rate sank from 600 inmates per day before Himmler's stop order, to just two or three. In the spring 1944, Rudolph Kastner in Budapest received the news from Bratislava that ." . . in Auschwitz, work is proceeding at a fevered pace on renovation of the gas chambers and the crematory, which have been out of operation for months." (Document PS-2605, page 5). Piper contradicts my assertion that from Spring 1943 until Spring 1944, gassings in Bunker II ("The White House," with thanks for his correction) continued inconspicuously and on a smaller scale than before and after. These were gassings of sick Jewish inmates as well as a majority of the 81,000 who arrived there during those eleven months but were never registered. The fact that this happened only once daily instead of several times corresponds to the "periods of less frequent transports" which Piper mentions. It is confirmed by witnesses such as Dragon (Piper's The Number, pages 207 et seq). as well as the circumstance that neither bunker was ventilated, which is confirmed by the instruction manual. For this reason the bunker had to be aired out for at least 24 hours following each gassing. In any case Bunker II alone, by my estimate, had double the capacity (triple, according to Piper) required to kill in daily gassings all the unregistered prisoners who arrived between June 1943 and April 1944 (242 per day on average). I have stated expressly (contrary to Piper's reproach) that Bunker I, the red farmhouse, was used for gassings only until the spring of 1943. The cellars in the crematoria were not needed. Piper challenges my estimate that a maximum of around 400 victims could be crammed into a gas chamber having an area of 90 square meters (even smaller than a streetcar platform). Van Pelt, the famous expert against Irving, estimated only 250, but Piper estimates 800. That would be nearly nine persons per square meter, the size of one telephone box or four concrete terrace stones. During the Auschwitz trial of 1965, the Frankfurt court adopted the figure of 3.5 persons per square meter for the crematory cellars, corresponding to the information they had at that time. I assumed five per meter for the farmhouses. As for Piper's assumptions about my motivation, I would like to insert a personal note. In the course of my anti-fascist upbringing in 1958, I served as leader of 600 members of "The Falcons," the Berlin regional organization of the Socialist Youth of Germany, in a visit to the newly opened of museum at Auschwitz. Accompanied by a museum employee, I later strolled about the surrounding meadows of the area. I expressed my inability to comprehend how four million victims could allegedly have been annihilated without a trace of their remains. The employee, a former prisoner, removed a knife from his boot and plunged it into the grassy earth. Bits of human bone adhered to the blade and grass roots. Mr Irving's Radical's Diary: "The Battleship Auschwitz is still sinking after all -- if it has not been sitting, just upright, on the sandy bottom ever since 1988, already mortally torpedoed by Fred Leuchter."